Rated 5 out of 5 by snoopycraig from The Best Ever This has to be one of the most unique HOG games ever! Very very challenging and fun. 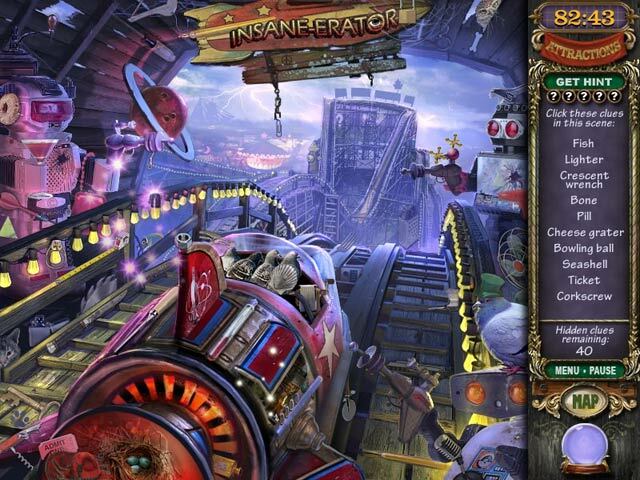 The mini games are very hard and the hidden object scenes are great. I bought the next Madame Fate game and was hugely disappointed in it. I am not a fan of the creepy stories and collecting clues to get to the next scene. Just not my thing. Madame Fate is not like that at all. I bought this game a long time ago and still return to it and still enjoy it. Wish Fates Carnival had been similar. 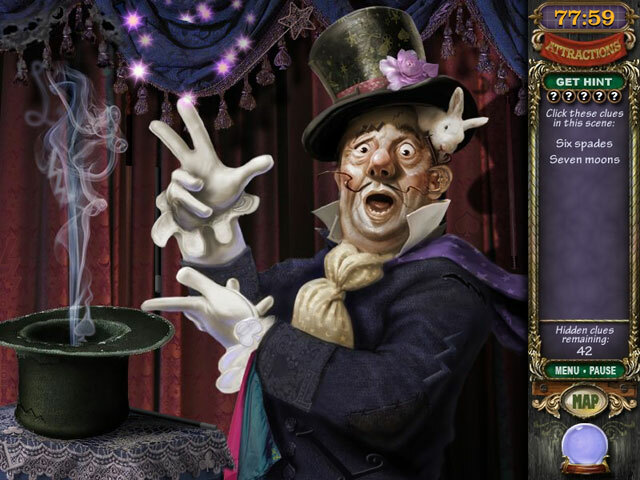 Rated 5 out of 5 by Homeimps from Puzzle Lover's Delight I'm not big on Hidden Object games that offer nothing besides hunting for items, but it was worth it to play those just to get to the puzzles. Some of them really had me scratching my head and for me, that's the sign of a good puzzle. The only thing that would have made it more enjoyable would have been the elimination of the timed mode, but not a huge issue for me. Lots of fun playing this one and a pleasant surprise after the first two MCF games, which were just too boring for my taste. Rated 5 out of 5 by valintine1 from Great game I was wild for this game; it went on and on and on. I managed most of the puzzles O.K. ; some were harder. The graphics are excellent, there are morphing objects, and the game kept me intrigued throughout. Rated 5 out of 5 by Lioness901 from Good fortune awaits those who play this Madame Fate reveals that at midnight she will be killed unless you can find the murderer and stop them before time runs up! Madame Fate cracked me up her comments are so funny. The scenes are so much fun to play. The ending surprised me but I enjoyed the surprise it's a really good story. Rated 5 out of 5 by Blackie110 from THE BEST, BEST, BF GAME ON THIS SITE This is my second review for this game because I just finished playing it for the third time. There is NO game on Big Fish that could match this one. Absolutely the most enjoyable game I have played here in years and years. Why is there not a Madam Fate 2??? Come on MCF you should listen to us players. How can you not follow up on such a great game? Rated 5 out of 5 by gr8mom31 from Wonderful Game!! 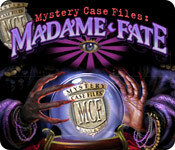 This is old school Mystery Case Files!! I have been playing MCF games since they first came out. This was maybe the 4th or 5th game, before all the screws and tools. This is one of my all time favorite games!!! I wish they would make more like this one. I think the carnival theme is fun and finding all the objects on the characters is entertaining. I am so happy to see this for Mac users! Rated 5 out of 5 by Joschi2 from Best of all!! This game made me playing! 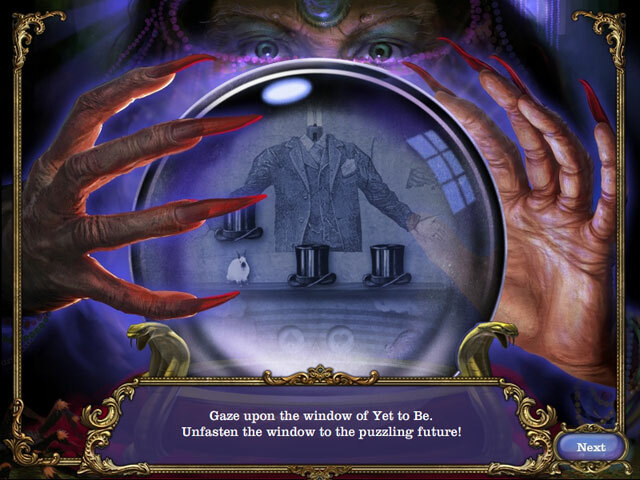 It was the first "Hidden-Object-Game" I ever played. This happened years ago - and although there are now so many games in this genre, "Madame Fate" is a game I love to often play again and again. Rated 5 out of 5 by Kat4HOgames from An old classic! I was so glad to find this game on BF, it is so much fun and the puzzles can drive you to drink!!! I sure wish there were more HOG games like this one out there today, I love this game and have played it many times.